Praising the cozy beds free breakfast convenient university-area access and complimentary Wi-Fi our guests well-schooled in value enjoy La Quinta Inn Tampa Bay USF. The four-story La Quinta Inn & Suites USF has 109 rooms and suites and an interior-corridor layout. All spacious accommodations feature comfortable beds and free in-room Wi-Fi. 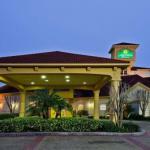 La Quinta Inn Tampa Bay USF has an outdoor swimming pool a hot tub a guest laundry and a 24-hour fitness center. In the morning guests can enjoy a complimentary continental breakfast. Parking is free and pets are welcome. La Quinta Inn Tampa Bay USF is directly across the street from the University of South Florida campus which includes Shriners Hospital for Children Veterans' Hospital Moffitt Cancer Center and the Sun Dome. The hotel is one mile from Busch Gardens and Adventure Island. Within five miles guests will find Lowey Park Zoo and Seminole Casino.Tampa International Airport is 17 miles away. Dogs of all sizes are allowed. There are no additional pet fees. Dogs may be alone in the room if they will be quiet, well behaved, a contact number is left with the front desk, and the Do Not Disturb sign is left on the door. Dogs must be leashed and cleaned up after.